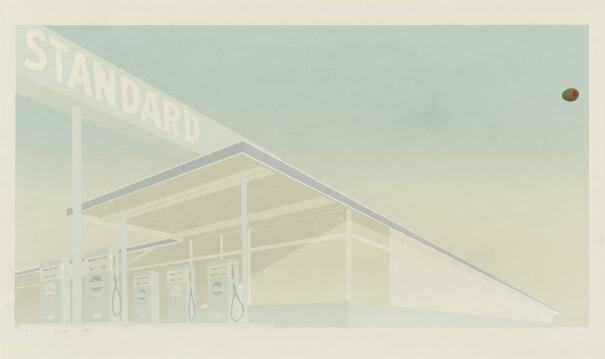 Quintessentially American, Ed Ruscha is an L.A.-based artist whose art, like California itself, is both geographically rooted and a metaphor for an American state of mind. Ruscha is a deft creator of photography, film, painting, drawing, prints and artist books, whose works are simultaneously unexpected and familiar, both ironic and sincere. His most iconic works are at turns poetic and deadpan, epigrammatic text with nods to advertising copy, juxtaposed with imagery that is either cinematic and sublime or seemingly wry documentary. Whether the subject is his iconic Standard Gas Station or the Hollywood Sign, a parking lot or highway, his works are a distillation of American idealism, echoing the expansive Western landscape and optimism unique to postwar America. Signed, dated and numbered 31/150 in pencil (there were also 10 artist's proofs), published by the artist, please contact the department for a detailed condition report, framed.